Regal Cinemas, formerly known as Regal Entertainment Group, is an American movie theater chain headquartered in Knoxville, Tennessee. Regal operates the second-largest theater circuit in the United States, with over 7,307 screens in 564 theaters as of June 2016. The three main theatre brands operated by Regal Entertainment Group are Regal Cinemas, Edwards Theatres, and United Artists Theatres. These chains retain their exterior signage, but most indoor branding (popcorn bags, policy trailers) uses the Regal Entertainment Group name and logo. Where applicable, the REG logo is used alongside the three individual brands. Most new cinema construction uses the Regal Cinemas name, although Regal has built new Edwards locations in California and Idaho. 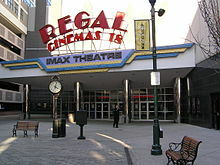 Regal has acquired several smaller chains since this merger; these, however, have been rebranded as Regal Cinemas. Regal Entertainment Group completed its acquisition of Consolidated Theatres on May 1, 2008. In the transaction, Regal acquired Consolidated's 28 theaters and 400 screens for $210 million. Consolidated's concentrations of theatres in the Mid-Atlantic states of Maryland, Virginia, Tennessee, Georgia and North and South Carolina overlapped in some places with Regal's. As of a condition of approval of the merger, the United States Department of Justice required that Regal divest itself of several theaters in areas where it would have a monopoly. Regal agreed to sell off four theaters in the Asheville, Charlotte and Raleigh, North Carolina markets, but a large number of theaters still remains in all three markets. The Regal Foundation was organized in 2003 by Regal Entertainment Group in order to engage in charitable activities directly and by providing funds to other organizations, golf tournaments, and the University of Tennessee. The Regal Foundation holds a large in-theater donation drive during the summer months of the year known as "Stars of Hope". During this event patrons can donate $1 to the Regal Foundation. The names of donors are written on individual stars and posted on a "wall of fame" visible in that patron's respective theater. [ non-primary source needed] On January 2nd 2019 the Regal Employee Pass for movie tickets went from 2 free tickets a Day to only 2 free tickets a Week. ^ " Contact Us." Edwards Cinemas. May 10, 2000. Retrieved on February 2, 2011. "Our corporate offices are located at: 300 Newport Center Dr. Newport Beach CA. 92660."